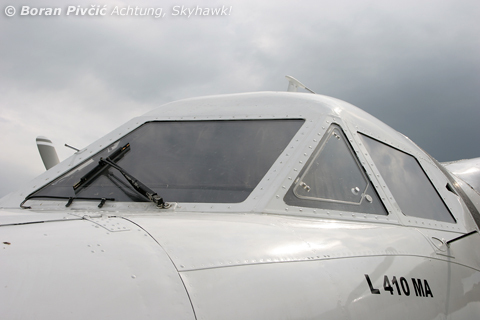 Photo Report – Let L-410MA Turbolet, OM-PGD | Achtung, Skyhawk! 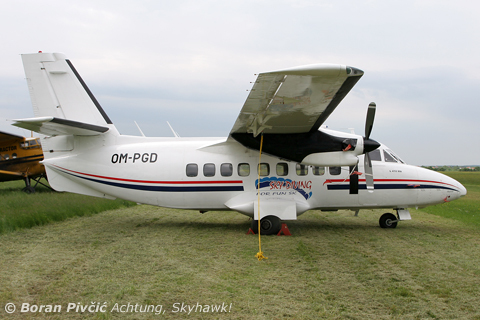 Designed from the outset to be powered by the Czech Walter M601 turboprop – the PT6 of the Eastern Block – that was in development at the time, the first production L-410s got off to a slightly more ironic start when M601 development delays and problems forced the temporary selection of another engine. The only one suitable and available was the PT6 itself, so to avoid any further disruptions, the first production series – the 28-strong L-410A – was fitted with two PT6A-27s and sent on its way. In the mean time, the basic M601 design had matured into the slightly larger and more powerful 700 HP M601A which – coupled with an Avia V508 three-blade propeller – was deemed ready for the L-410. In this form the aircraft became the slightly-less rare L-410M, of which about 108 were produced. 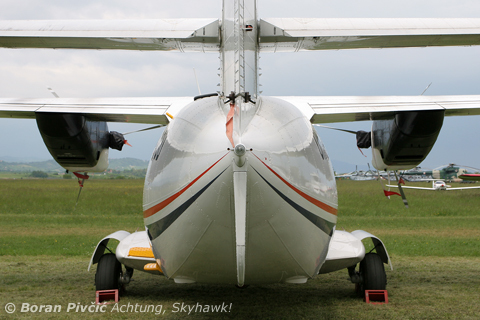 What can today be considered as the “bog standard” Turbolet – the UVP – differed in some respects from the M model from which it was developed, including a slightly longer fuselage, larger wings, a taller vertical stabilizer and 730 HP M601B engines. And while the M didn’t have what you’d describe as a long take-off run, the UVP was the first model to introduce the STOL capability for which the design is now famous (500 m with a 1800 kg payload!). 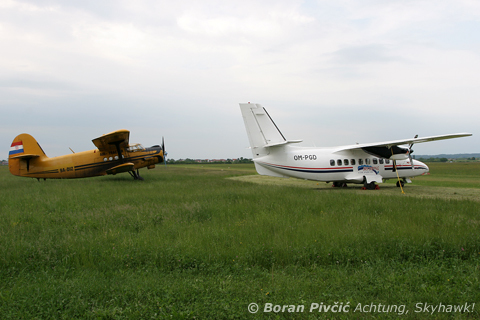 The MA though was a mix of the two worlds, being the basic L-410M powered by the UVP’s M601B engines. Where it fits into the design lineage I’m not sure, but given that almost all M versions flying today are MAs, it is safe to assume that this version is a retrofit. Be that as it may, it represents the last of the L-410 “originals” and was sufficiently rare to get my full attention :D.
Blending well with the dull overcast... like on many parachute versions, the standard doors had been removed and fitted with a much more practical "garage door"
This is a great looking aircraft. 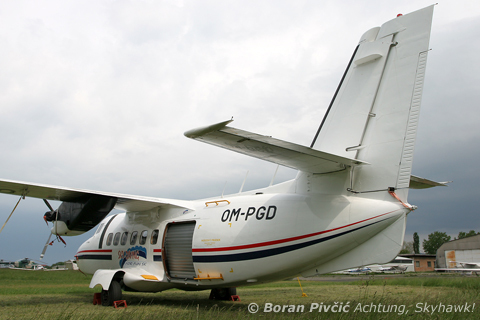 It reminds me of a Mitsubishi MU-2. Once I worked at refueling private aircraft … and I disliked refueling this aircraft. 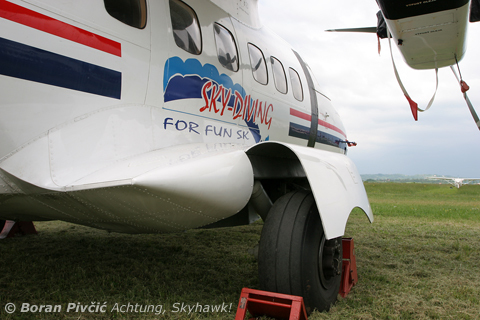 It had five fuel tanks and none interconnected so each had to be accessed … which meant lugging the ladder and getting it set up properly. The interior was nice. I think its a great touch to set the main gear outboard making for a smooth, and more usable, cabin floor. 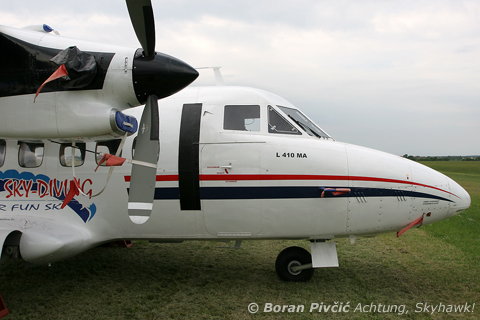 The L-410 is a fantastic little aircraft, like a mini DC-3. 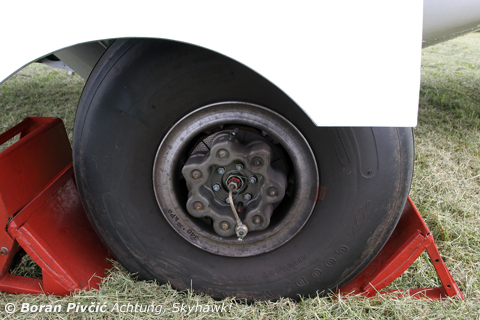 It’s tough, durable versatile and suited to a variety of climates, which makes it a common sight in South America. Even in Europe a number are still flying commercial operations, notably in the UK to the Isle of Man :).